This page will detail my collection of old gas turbines and some of things I get up to with them. I've been collecting and playing with old gas turbines for some years now; I finally concluded that old computers were fun but didn't make enough noise. I have my old friend Chris Quayle to thank for this dubious pursuit; he told me he had been interested in this for years but never got round to doing anything about it... I did. I'm interested in all engines small enough to be practical for home tinkering, which means apu engines, ground power/air start units, small helicopter engines, target drone/cruise missile sized engines, and small jets - up to Viper/J85 size. Other individuals who are partially to blame for this include Ian Bennet, an even worse case than my own as he has attempted (with some success) to build his own engines, and Richard Brown, an extreme (possibly terminal) case, as he has built and ridden a jet powered motorbike, has just taken the British motorcycle land speed record on a rocket bike, and now plans to take the world record! The RB108 is one of his; it was to be the powerplant for his record bike but he decided to go the rocket route instead, so I swapped a Gnome for his 108. Plessy 'Solent' gas turbine starter (from the RR Spey engine used in Phantoms). 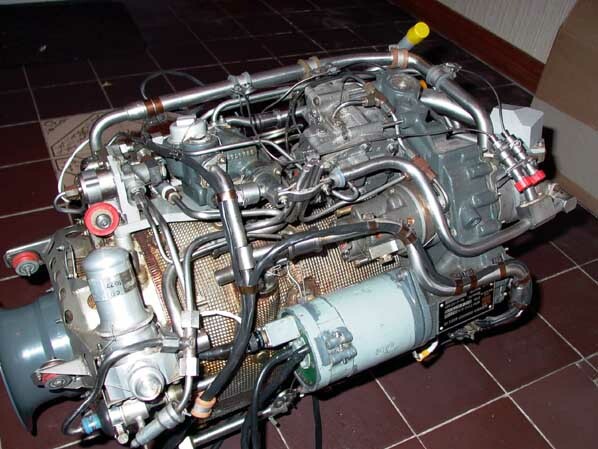 A complex beast... the KHD (Klöckner-Humboldt-Deutz) T312 APU, used on the RAF Tornado. accessories (generators, hydraulics etc.) at a reduced power setting. 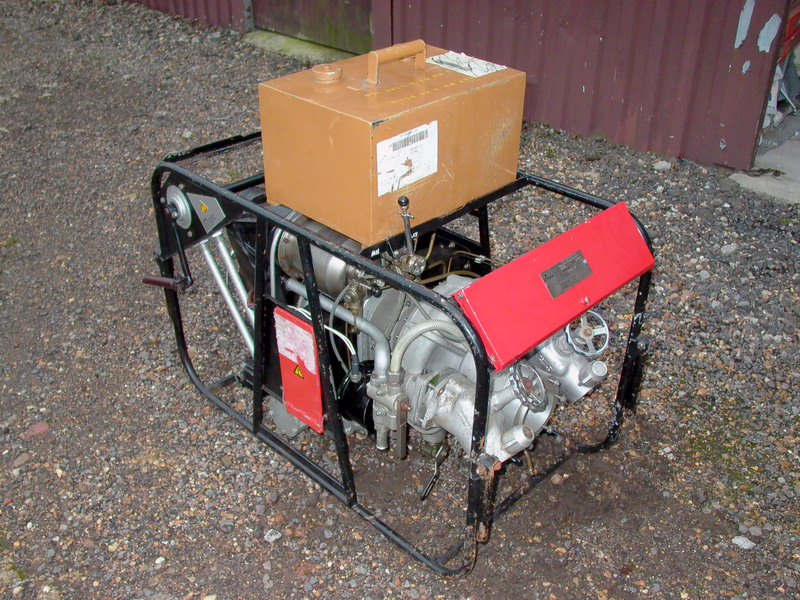 More similar to the Lucas units used on the Pegasus engine in the Harrier in that respect. There is also provision for a small bleed air supply which cools the fuel supply - it's not big enough to run the A/C packs. The sharp end. 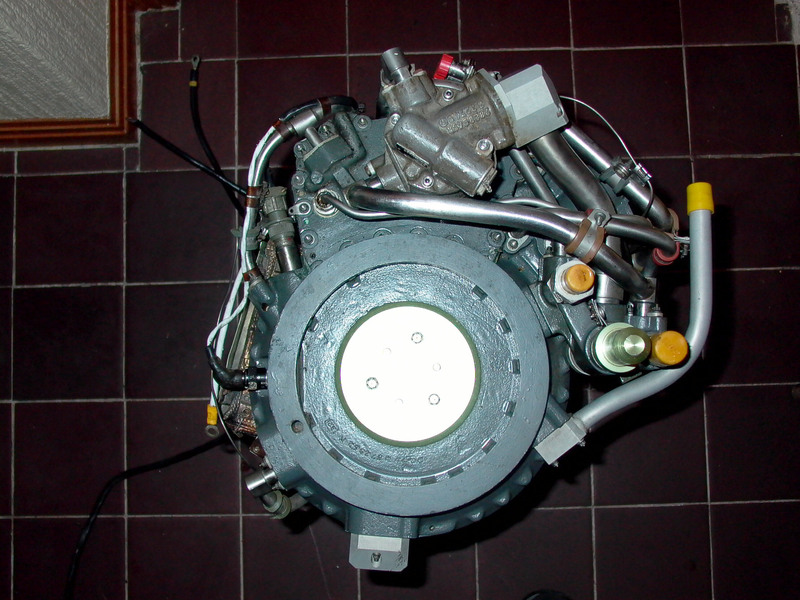 The compressor is actually a two-stage affair; the visible part is a single axial stage. This is followed by a centrifugal stage. On later-build T312 units, the two-stage compressor is replaced by a more advanced single-stage centrifugal compressor. As can be seen, the engine is in beautiful condition - by the looks of the exhaust duct it has clearly been used, but it's still very nice! The yellow cover at the 2 o'clock position covers the bleed air outlet. The blunt end. 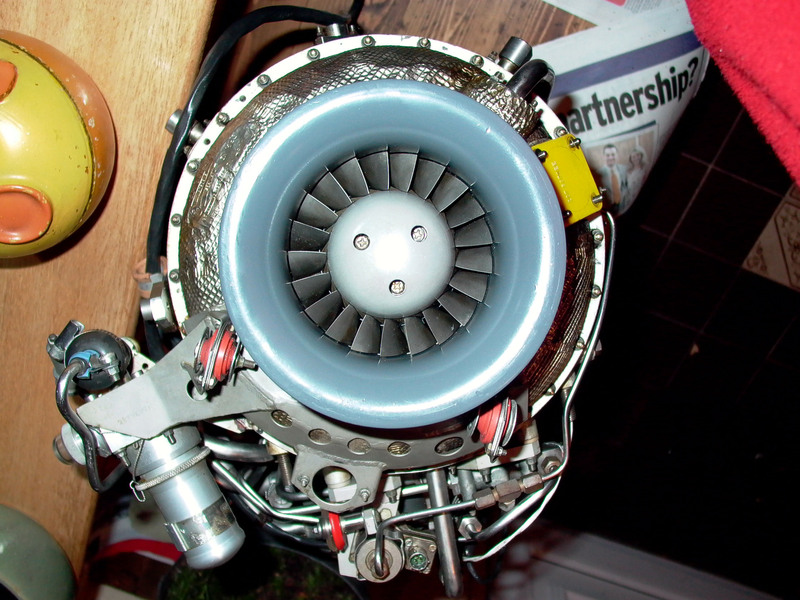 A metal plate covers the power takeoff splined shaft. The noisy end. Another metal plate covers the exhaust duct. Starter motor is in centre, fuel & oil pumps below. put a gas turbine on it! Used for civil defence, and by the Royal Navy for shipboard firefighting. 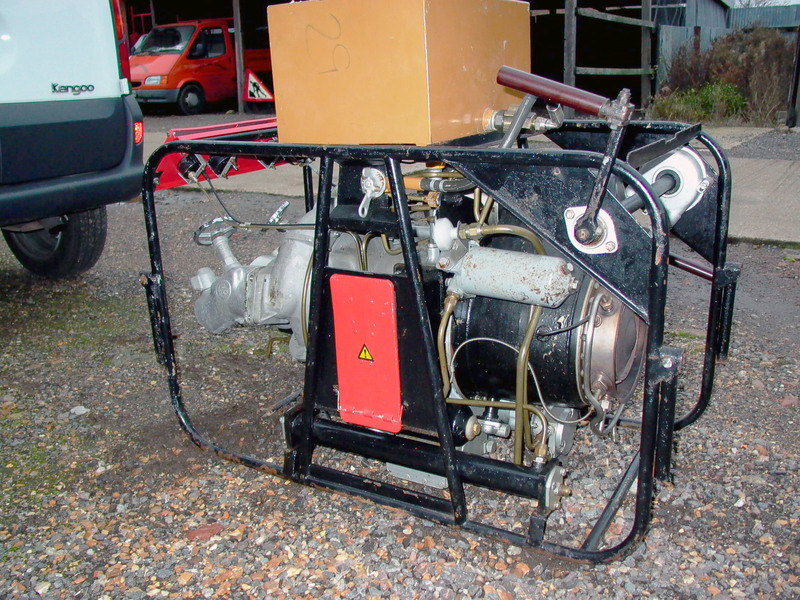 Rover 1S- series engine, magneto ignition, hand-crank start. Batteries not included - none required! In the above view, the water pump with fire hose connections is clearly visible. The red panel above it covers the instruments. The other side. 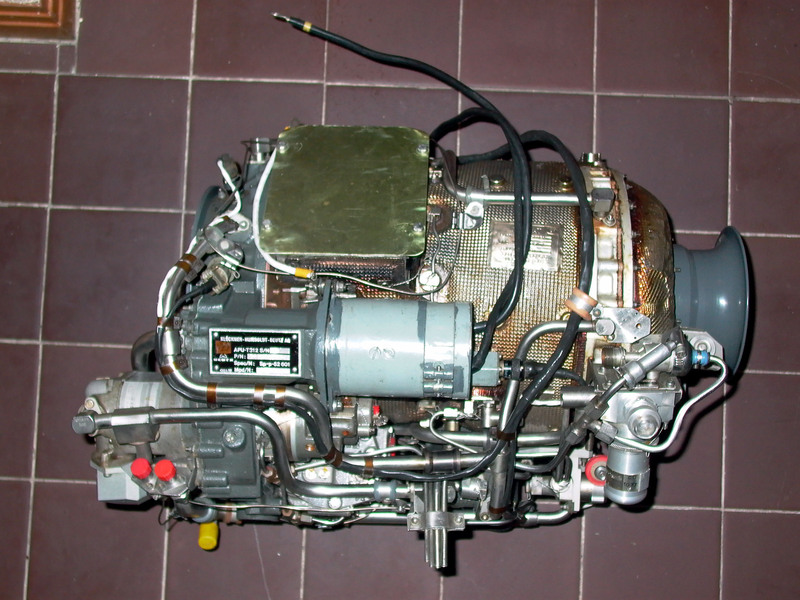 The turbine engine is the black-painted part. The red flap in the middle covers the air intake; it is removed before running. Unless you are *very* jetlagged. In which case you attempt to start the engine with the flaps still closed. This is an unrewarding experience. Note the hand cranks - one either side. Starting this engine is strongly reccomended to be a two-person job; it's bloody hard work! 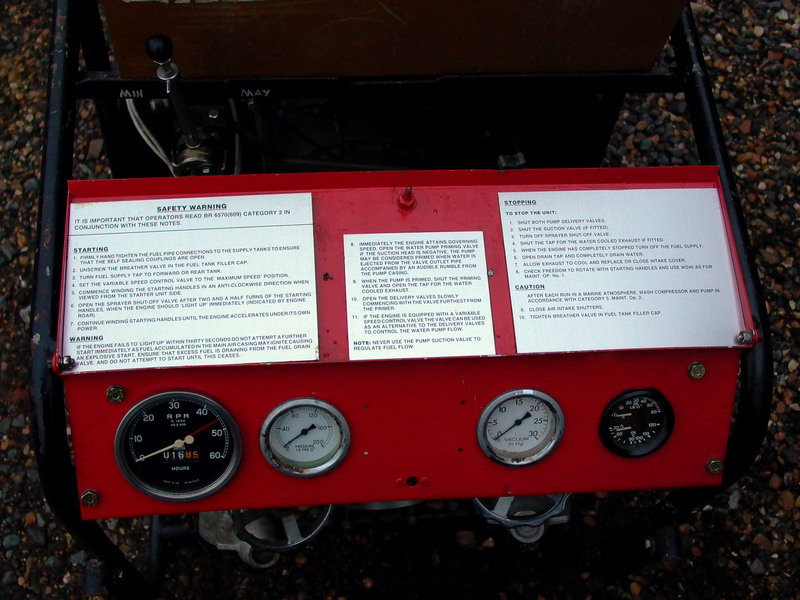 The instrument panel. RPM, water pressure, vacuum, oil pressure and temperature gauges - but no EGT gauge, oddly. 1685 hrs TT or 16.85hrs! This thing, running on afterburner in a confined space, was seriously, catastrophically noisy. Lots of diamond shockwaves! 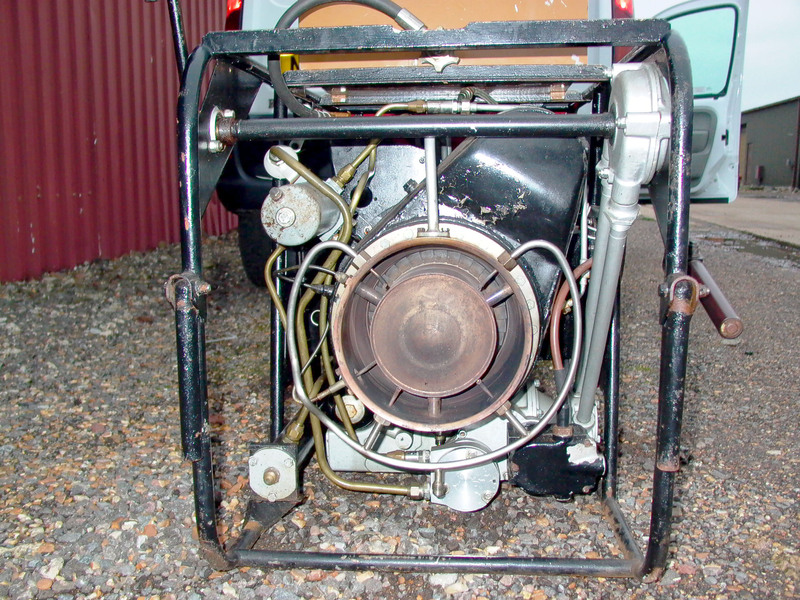 A Microturbo TRS18 small jet thrust engine, used in missiles and target drones (is any kitchen complete without one???). HOT NEWS - this engine has been SOLD to a friend who has a real use for it. Just been run up - note the half-cut Coke bottle used for gravity feed of fuel. The hot end. Renewed all the Aeroquip hose connectors - looked pretty smart. As found at the rural premises of Barry Parkhouse... pretty grotty! Another US engine - another copy of French design; Continental C141 from starting cart - very similar to Palouste. Compressor cover cleaned, painted, reassembled. More money for Aeroquip! A Rolls-Royce RB108, a Viper-class engine of around 2,500lb thrust, used in experimental VTOL. I was able to resist it when I found it was indeed zero-houred, but had been pretty well trashed by endless stripdowns and reassemblies by RAF apprentices - *everything* was out of tolerance, it wouldn't even turn!